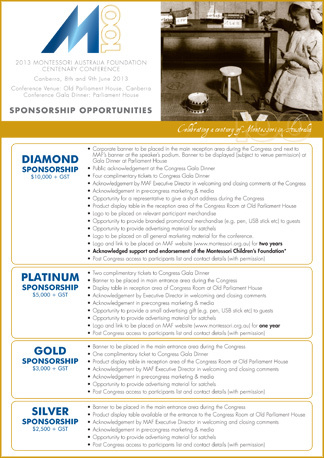 MAF proudly invites sponsorship support as we celebrate the Centenary of Montessori Education in Australia to be formally launched in Canberra on 8 and 9 June 2013. The celebrations will include a Centenary Conference which will be held at Old Parliament House and will bring together educators from Australia and overseas to hear a program of eminent local and international speakers. A Gala Dinner will be held on the evening of 8 June at Parliament House. It is expected that over 350 delegates will attend during the weekend celebrations. Celebrations will not be limited to the two-day event in Canberra. Each school and centre in Australia will be invited to organise a celebratory event in their local community during 2013. A national media campaign will also be established to promote Montessori education including the launch of a new website and social media sites. A Centenary book will be launched at the Conference in Canberra outlining the history of Montessori education in Australia. 2013 will be an exciting year of events for Montessori educators throughout Australia. We invite participation through sponsorship of our major events. Full details are outlined in the Centenary Sponsorship Brochure.